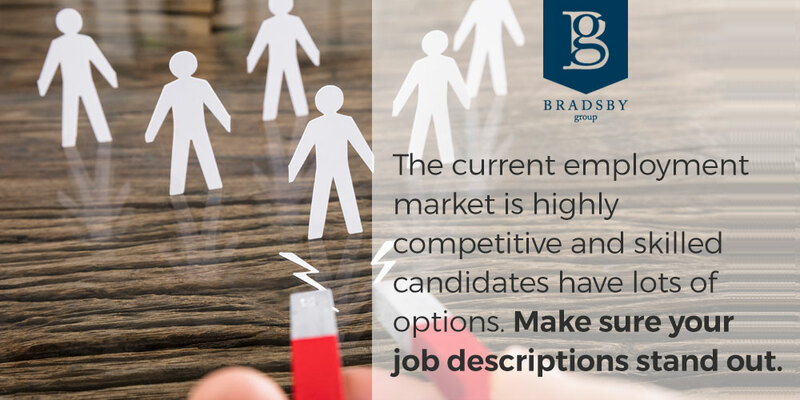 Job descriptions are our daily reading at Bradsby Group. We’ve seen remarkable job descriptions, but we’ve also seen many that are bland. In the search for highly qualified candidates, your job description needs to stand out as much as the person you want to hire. Great job descriptions set the stage for great candidates. Here’s how to write a job description that attracts top-tier talent. Before we go further, some clarification: Job descriptions serve two purposes. They can be available externally to potential employees as part of job listings. They are also internal documents essential to guiding and evaluating job performance. Your company might have an internal version for management and an external version for hiring. What we’re talking about here in the blog post is the external version that is used to attract candidates to join your team. The standard job description components are well known. They include the job title, its duties, work experience and educational requirements, necessary skills, other optimal skills, temperament sought, and parameters of the job such as required hours, and in some cases, physical requirements of the job. Care must be taken to ensure that job descriptions adhere to employment law, of course. For instance, how do any physical requirements of the job, such as ability to lift or stand, square with the Americans with Disabilities Act (ADA)? The language chosen can have legal ramifications. HR specialists will be your best guides to ensure compliance. Should a job description include salary information? Maybe, maybe not. We work with our clients to determine whether strategically it is most beneficial for them to share salary information or not in this initial stage of their candidate search. We encourage you to step back and examine the look and feel of your job description, too. How you present it is as important as the information you are conveying. The current employment market is highly competitive. Skilled candidates have lots of options. Just as they make an effort to rise above the rest of the field, your organization needs to do the same. If your job description is bland and doesn’t engage potential candidates, they’ll move on to read someone else’s. White space is your friend. Blocks of gray words discourage people from reading it. Everyone scans these days. Help them focus by using white space to frame smaller, distinct blocks with headers that guide them where to look next. Short is better than long. Write short sentences. Make short lists. Bullet points help, but they only go so far. Too many, and it’s just another block to scroll through, losing specificity. Don’t feel like you must delineate every characteristic of your ideal candidate. What are the key traits you’re looking for that will contribute success to your team? Four or five should be enough. Don’t repeat all your company info. Send them to your website instead. They’re going to look you up anyway. But what about your company sets you apart? Do include that. Even if your web copy makes it clear, and hopefully it does, we recommend putting a sentence or two at the beginning of the job description to convey why people love working for you. Whether the document is being used during hiring or in ongoing employee evaluations, such a statement brands you to your team to remind everyone of shared values and goals. Need help with how to write a job description? Would you like some feedback on the job description for an open position in your organization? We would be happy to take a look at it to make sure it will perform optimally to engage the quality of candidates you are seeking. We welcome your call or email.